Permanent Change of Station is a term associated with intense feelings ranging from elation to terror, depending on your personality and previous PCS experiences. Add to this the highly personal nature of what an overseas move means to each individual or a family unit, and watch emotions run high. Because an overseas PCS is so stressful (even if you want to go! ), there are many dedicated resources to pick through to help with the generalities of the move. 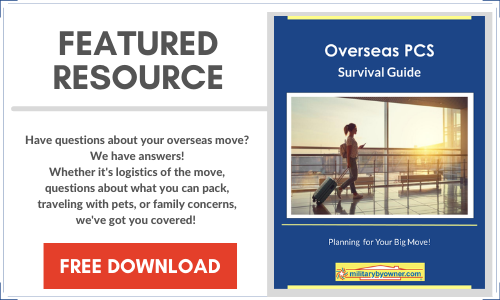 MilitaryByOwner's article, Planning Your Overseas PCS, can help you get the process started, and MilitaryOneClick just published The Colossal List of PCS Resources and Advice from Military Spouses, which includes a comprehensive checklist for an OCONUS move. But what about precise, in the know, deep thought, information for a PCS to Okinawa? Since I didn’t have the personal experience, I set out to find milspouses who either have been there or are doing that and have honest intentions of making your life easier by sharing their tips and tricks for moving to and living in Okinawa. Let’s see what they have to say, because sometimes you just need to know where the best chicken and waffles dinner on the island is found. Education specialist Meg Flanagan is doing the Okinawa move and has so many great tips to delve into, but her main suggestion is to seriously get in touch with families who've been there within the last year and take in all the advice they’ll give. Expect to become your own best advocate. Sometimes the easiest or traditional way of moving is not the best way for your family’s situation. Get the proper health screening for humans and pets if Okinawa orders are likely, even before the orders arrive. Make sure everyone has both of their passports accurate. There are two types to apply for: a standard and a no-fee military passport. The process is time consuming and should be started months in advance from departure dates. Space available for pets on military flights is limited and usually filled by mid-March for flights leaving in May and June. MBO’s Danielle Keech supplied information from her Marine Corps spouse friend, Jen. She describes the culture of military families as very tight knit because of the limited space on the island and the frequency of their spouses leaving extendedly for work trips. Friends turn into family quickly in many cases. She also offers these bits of advice. You'll probably live on base; typically, only larger families will be offered a home off the installation. Crime really isn’t a consideration, so there aren’t the standard “bad” places to avoid. Experience the culture as much as possible and visit places like Shuri Castle and The Churaumi Aquarium. Local beach and water activities are always available, and she recommends hiking as a family activity. Traveling is important--not only checking out resorts like Okuma on the island, but heading to countries that are quick trips away. South Korea, China, Thailand, and Indonesia are all great options. Jen has particular affection for the snow activities in the mountains of Hokkaido, the northernmost island of Japan. Trisha Lozano is a girl after my own heart and has supplied MBO with very important information: exactly what to eat and drink while you are stationed in Okinawa! She’s got some practical advice too, but it’s not nearly as fun! CC’s Chicken & Waffles is the place to be for a little piece of home back in the U.S.
Sushi bars are operated with English touchscreens. She’s a fan of the Starbucks drive thru and recommends the Sakura ice coffee. Trisha also suggests tasting the multitude of Kit Kat flavors found in Japan. Who knew? Don’t ship your cars. It’s too expensive to drive them legally. At least two dehumidifiers are necessary for maximum comfort at home. Find and buy a phone from a local swap page. NextGen Milspouse’s Michelle Volkmann is also an Okinawan veteran and she agrees with Trisha about finding a new phone on the local swap pages, but also shared her own tricks. Space and authorized weight allotments are very limited. Store as many household goods as possible. You’ll need room to return home with new goodies you find not only in Okinawa, but while you travel the region. Consider a driver’s license, it’ll give you a lot more freedom from base. But, don’t bother with a new car. Buy a used one. Michelle found Okinawa Hai and Okinawa Living especially helpful for finding excursions and activities. Before arriving, save up a good chunk of change because startup costs for phones and cars are expensive. Plus, you can never account for the random expenses that will more than likely occur during a PCS. A few themes I noticed from Meg, Jen, Trisha, and Michelle’s advice seemed to overlap within their specific experiences. Extreme preparedness, an open attitude,and a willingness to explore were the ideas that heavily influenced all of their specific journeys. Sounds like the recipe for a successful CONUS move too, right? So the point is, pump up the current PCS skills you have now and add a little bit of insight from veteran or current islanders and the move might feel a little less scary, leaving more emotional space to enjoy the anticipation and experience Okinawan living together.